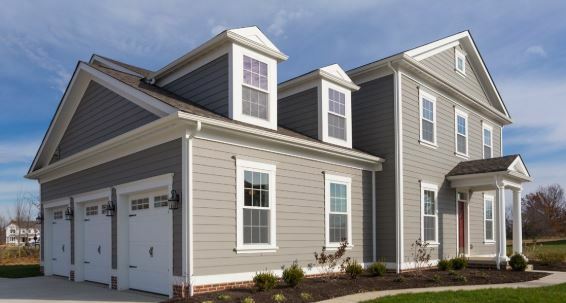 One of the best types of siding you can get for your money is without a doubt Vinyl, contact the experts at Beckworth LLC to discuss our vinyl siding Raleigh options with you. Vinyl siding is made up of a plastic material which is used to cover the exterior siding of your home. This siding serves as weatherproofing, imitating wood clapboard and is used instead of other materials like aluminum and fiber cement. This is a manufactured material which gets its low cost and properties from being a polyvinyl chloride (PVC) resin. If you are considering siding for your home, here are five major advantages of vinyl siding. In general, vinyl siding is a popular choice for many homeowners because it’s quite cost-effective. According to CostHelper, professionally installed vinyl siding can cost you between $2,500-$8,750 for 1,250 square feet, while professionally installed wood siding can cost you $6,500-$10,000 for the same square footage. If you’re interested in installing vinyl siding your self, it can significantly cut your costs to $1,000-$1,250 for every 1,250 square feet. Today’s vinyl siding comes in hundreds of colors, textures, and profiles to give you complete versatility in designing your dream exterior. Like the look of cedar shakes but prefer the qualities of vinyl? You can find a vinyl replacement that looks so authentic, it fools even the most discriminating eyes. Vinyl siding is made to withstand the elements, including heavy wind and impact from hail. In addition, vinyl resists excessive moisture, meaning it won’t rot or corrode over time. In many cases, you can get a lifetime warranty on your vinyl siding that is often prorated for up to 50 years on successive owners. When it comes to siding, vinyl is about as low maintenance as it gets. Since it resists pests such as termites and blights such as rot, it will keep its original qualities for many years, giving you your money’s worth. Also, you’ll never need to paint your home — a simple cleaning once a year or so is more than adequate to maintain its original good looks.